Oats or rolled oats commonly eaten in the form of cereal or porridge. For the past few decades oats have become very popular "health food" and is loaded with dietary fiber and had a range of healthy cholesterol-lowering properties. To start your day with guilt free food, try this Oats &amp; Wheat Rava idly as an easy and quick breakfast or tiffin item. Heat the oil in a pan. Add all the ingredients for seasoning and fry until it splutters. Then transfer this seasoning to the curd. In other pan fry dry oats for 5 minutes with medium flame and keep aside to cool down. Blend to make a coarse powder out of it. Meanwhile grease the idly plates with oil, and add water to the cooker / idly steamer on stove to start heating in advance (may be when you are setting the batter ready) so that you could immediately start steaming after adding baking soda. Now add roasted wheat rava, finely chopped coriander, oats powder, salt and grated carrot. Mix well and adjust with water if required to the batter. The batter consistency should be fairly thick. Finally add baking soda and you will get to see the air bubbles appearing on the batter. Immediately pour the batter to the greased plates and steam for 10-12 minutes until cooked through. Don't let the batter sit after adding baking soda for long time. If the batter is more, do it in batches and add baking soda before steaming. Once steaming time is over, remove idly plates from the cooker / idly steamer and keep it out for couple of minutes. 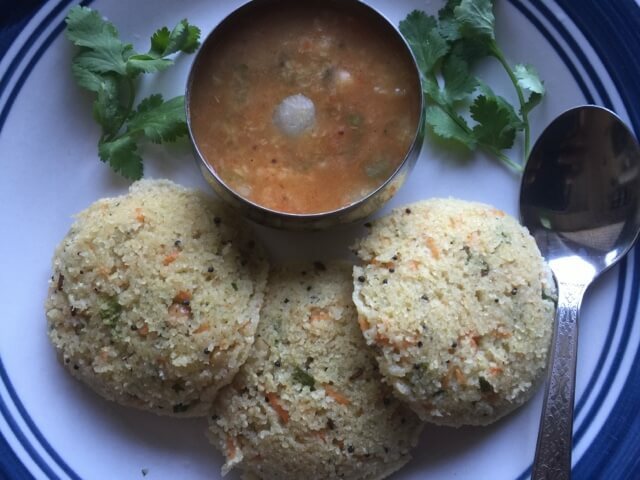 Take the idly out from the plates and serve with any kind of chutney of your choice / sambar. The taste of the idly is close to rava idly. It is good to start your day with healthy version of breakfast. Substitute Bombay Rava instead of roasted wheat rava. Dry roast rava (semolina) / wheat rava until it changes it's color to light brown. Since I used roasted wheat rava, I skipped that. You could even roast any rava at the time of seasoning also. Mix all the dry ingredients well in advance and store this in zip locks / air tight container in fridge for a month. Roasting the oats will remove the sticky texture.